Getting here is easy! Villanova Theatre is located on Villanova's main campus, near the corner of Ithan Avenue and Lancaster Avenue. Free parking is available in the Ithan Avenue Garage (I-1) across the street. It can be accessed from Ithan Avenue or from Lancaster Avenue. In addition, parking is available in the St. Augustine Center lot at the Ithan Avenue entrance. Enter through the main gate and tell the guard you are here to attend a performance. Please click below to open specific driving directions. Take the New Jersey Turnpike (I-95) to Exit 6 (Pennsylvania Turnpike (I-276)). Take the Pennsylvania Turnpike (I-276) Westbound to Exit 20 (Mid-County Interchange I-476 South/Chester). Follow I-476 South to Exit 13 (Villanova/St. Davids). At the bottom of ramp turn right and proceed east on Lancaster Avenue (US-30) for just over a mile to Ithan Avenue and turn right. Proceed half a block south on Ithan Avenue and the Ithan Avenue Parking Garage will be on your left. Take the Pennsylvania Turnpike (I-76) to Exit 326 (Valley Forge). Take I-76 (Schuylkill Expressway) to Exit 331A (I-476 South/Chester). Follow I-476 South to Exit 13 (Villanova/St. Davids). At the bottom of ramp turn right and proceed east on Lancaster Avenue (US-30) for just over a mile to Ithan Avenue and turn right. Proceed half a block south on Ithan Avenue and the Ithan Avenue Parking Garage will be on your left. Take I-95 North to Exit 7 (I-476 North/Plymouth Meeting). Take I-476 North to Exit 13 (Villanova/St. Davids). At the bottom of ramp turn right and proceed east on Lancaster Avenue (US-30) for just over a mile to Ithan Avenue and turn right. Proceed half a block south on Ithan Avenue and the Ithan Avenue Parking Garage will be on your left. Located centrally on Lancaster Avenue, Villanova University has two stops located directly on campus. Please click below to learn more public transit options. Take AMTRAK to 30th Street Station in Center City Philadelphia. Take SEPTA's Regional Rail Line, the Paoli/Thorndale line (Paoli Local) to Villanova Station - located directly on campus. When you leave the train, take the pedestrian tunnel under the tracks and walk straight through the walkway under Mendel Science Center. Walk towards the church until you get to the walkway to the church. If facing Lancaster Avenue, follow this path to the left. 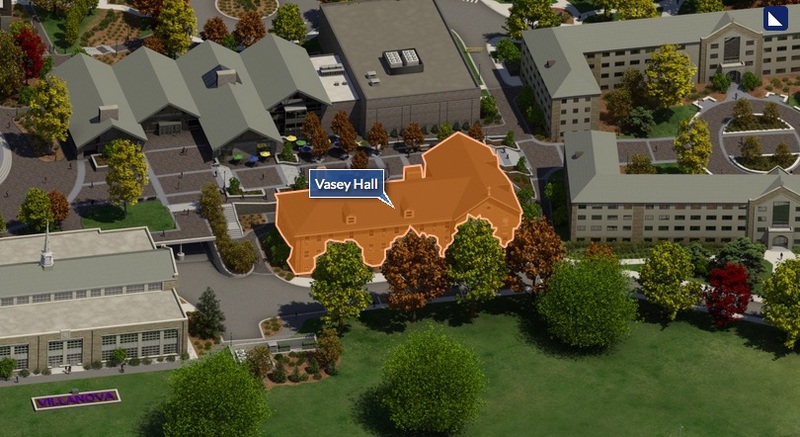 Continue past the cemetery and Doughtery Hall, and continue straight to Vasey Hall. SEPTA's Route 100 Line travels between Norristown and 69th Street Terminal. You may get on or off the Route 100 trolley at the Villanova Stop. Walk up toward the St. Thomas of Villanova Church, crossing Lancaster Avenue. At the top of the first set of steps in front of the Church, turn right and walk past the cemetery on your left (follow signs to the Office of University Admission). If you wish to learn more about getting to Villanova via Villanova Station. Please visit Septa.org for further details and to use their "Plan Your Trip" feature. Click on the image above to explore Villanova University's interactive, photo-realistic map. For futher information about traveling to and from campus, please click here. The theatre is wheelchair accessible. When ordering tickets, please inform the Box Office if you need assistance with wheelchair seating. When you arrive, please note that the handicap entrance is located in the back of the theatre across from the Connelly Center. To access this entrance, please walk around Vasey Hall towards the main brick walk, and make a left and you will see the entrance on your left-hand side. Looking for a place to eat before the show or grab a cup of coffee? Villanova University offers numerous places to grab a bite. Most conveniently located is the Connelly center, which is directly behind the theatre. Here you'll find a wide variety of food selections, as well as Holy Grounds the on-campus coffee shop. For more options, click on the mug icon to see a list of area restaurants. Evening performances begin promptly at 8pm. Matinee performances begin promptly at 2pm. We recommend that you plan to arrive at least 15 minutes early to account for parking and traffic. Unclaimed tickets may be re-sold once the show begins. Latecomers will be seated at the discretion of the house manager. Questions about planning your visit? Drop us a line to find out more! You may contact the box office by clicking on the button to the right to access our contact form. Please also feel free to contact the box office at 610.519.7474 or theatreinfo@villanova.edu.